On December 31st 1954, the Flemish newspaper Het Nieuws van de Dag announced a brand new story of Bob De Moor‘s ‘De avonturen van Nonkel Zigomar, Snoe en Snolleke’: “Het Mollenrijk”. Yesterday we talked about the differences between the cover version of the albums as published by Bédéscope and Brabant Strip. Today we focus on what is quite a remarkable change that happened in the story when it was revised for publication. Unlike the other ‘Nonkel Zigomar, Snoe en Snolleke’ albums, this album would not be revised on every page for a publication in color, instead for the Bédéscope version Bob De Moor decided to alter a few things, most notably on page 23 of the album, namely the strips 86/87 and 88 but also elsewhere. The excellently restored original version from 1955 as publicized by Brabant Strip 2003. 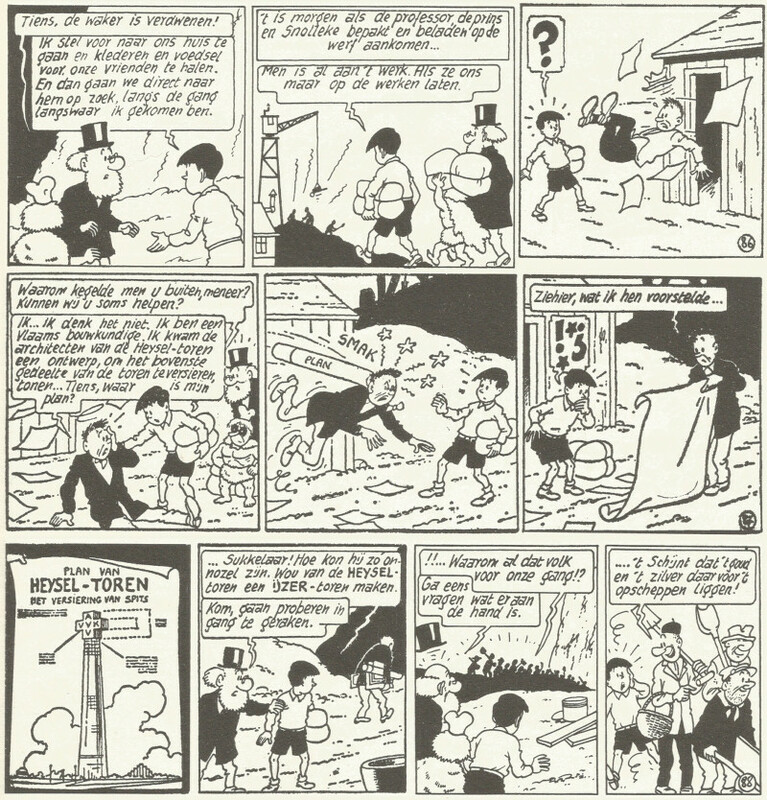 On the left you see the original strips as published in Het Nieuws van de Dag in 1955. You see a man being kicked out of a cabin. He says he is an architect who had been kicked out by the architects of the Heysel Tower. Snolleke looks at the plans and see that he wanted to build an ‘Ijzer-toren’ (literrally that reads as ‘Iron Tower’). Even for Flemish readers today the joke is not really easy to understand because many will miss a few long forgotten historical elements. An old early1955 newspaper article on the Heysel Tower. First of all, the Heysel Tower was an abandoned project from the Ghent based Professor Gustave Magnel for the Expo of 1958 to be held in Brussels, capital of Belgium. Dating from early 1955, when the decision to build the Atomium had not yet been taken, the tower of Magnel was supposed to be 500 meters high and constructed in prestressed concrete. That this tower really stood a chance to be built shows the article on the left. The artikel speaks of “a model of the tower of 500 m, which, as reported, will be built near the Heysel in Brussels.” Magnel was also the man who built the Boekentoren in Ghent. Nevertheless the idea was finally abandoned in favor of the Atomium. The next element is the actual plan of the architect in Bob De Moor’s story. He wanted to change the top of the tower as though out by Professor Magnel into a cross holding the letter combination AVV/VVK which stands for “Alles Voor Vlaanderen, Vlaanderen Voor Kristus”, a well known slogan from the Flemish movement. Not really a good idea since the Heysel Tower was supposed to be an architectural jewel representing Belgium’s intellect and know-how. The completely destroyed first Ijzertoren in 1946. And here we arrive at the 3rd element. Snolleke says: “Sukkelaar! Hoe kon hij zo onnozel zijn. Wou van de HEYSEL-toren een IJZER-toren maken.” Here we see a first reference to the (new spelling) IJzertoren. 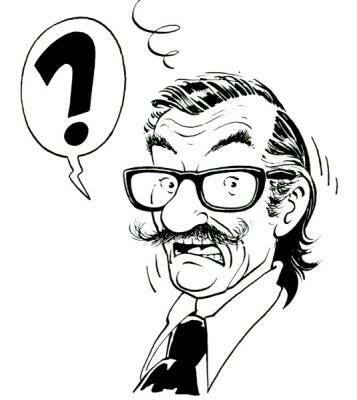 For this we need to go back in history and all this keeping in mind that Bob De Moor was a Flemish cartoonist first of all. So here we go. During the first World War the Flemish Movement became more and more organized and started to demand more Flemish rights. Good to know, back in those days the official language in Belgian politics but more important in the Belgian army was French and most officers were monolingual French-speaking. After the war, in 1930, the first IJzertoren was build in Kaaskerke, near Diksmuide. It was built by an organisation of former Flemish soldiers. The tower was just like on the plan of the architect decorated with the abbreviations AVV-VVK. Years passed and but up till World War II, the main language in Belgian politics and the army remained French. In short, the Flemish movement hadn’t been able to change a lot. After World War II, many Flemish were accused of German collaboration. Either by the state (242 people were convicted and executed), or by former members of the resistance (which happened uncontrolled). Other results of the repression included the demolition of monuments, and that also happened to the IJzertoren. On the night of 15 and 16 March 1946, the first IJzertoren was blown up. The perpetrators were never caught, but there are theories of the Belgian state approving the demolition, or even helping the saboteurs. 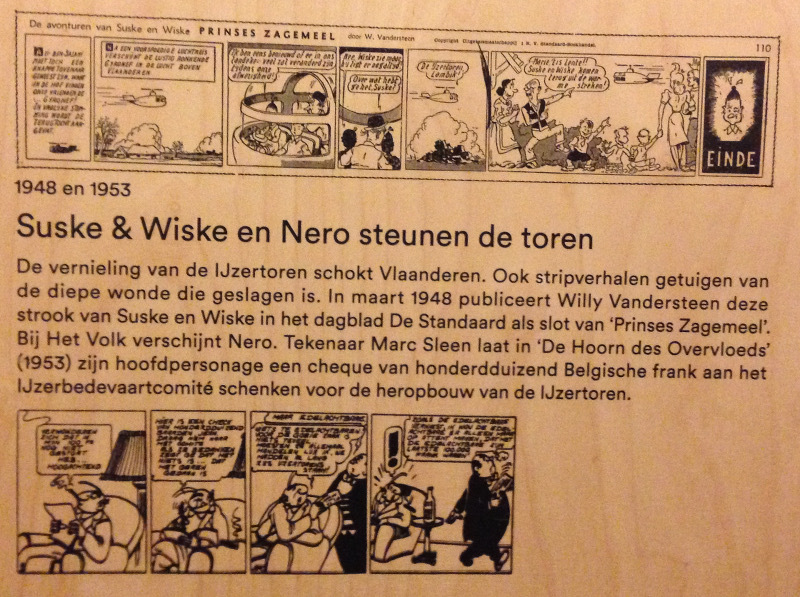 Both Willy Vandersteen and Marc Sleen would have the Ijzertoren topic incorporated in their work as shown in the permanent exhibition in the Ijzertoren in Diksmuide. When Bob De Moor saw his “Het Mollenrijk” published in the Flemish newspaper Het Nieuws van de Dag in 1955, the Flemish movement was busy assembling money to build a new and larger tower on the same site. 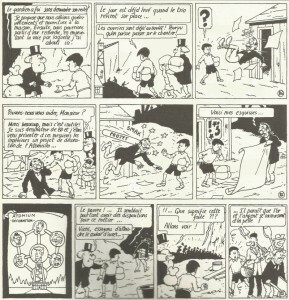 And it’s in that context that you have to see Bob De Moor‘s original strips. Bob De Moor was not the only Flemish cartoonist to include this in his work (see also our future article on the 1950 Tijl Uilenspiegel story “Het vals gebit”). Also Willy Vandersteen and Marc Sleen would have the topic incorporated in their work. 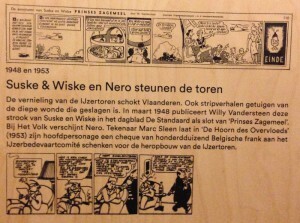 Willy Vandersteen would insert 2 specific frames in the final strip of the De Standaard newspaper publication Spike and Suzy‘s “Prinses Zagemeel” (1948). There you see Spike saying “No Wiske but he is still down” to which Ambrose aka Lambik says “What are you talking about Spike?”. Spike replies -while flying over the rumble of the monument: “The Ijzertoren Ambrose!” Marc Sleen from his side lets Nero give a cheque of 100.000 Belgian francs (2500 Euro) to the IJzerbedevaartcomité (the committee that organized the yearly pelgrimages to the Ijzertoren) in the album “De Hoorn des Overvloeds” and this in order to help reconstruct the tower. As you can see there were a lot of Flemish sensitivities that played back then, even with Flemish cartoonists. 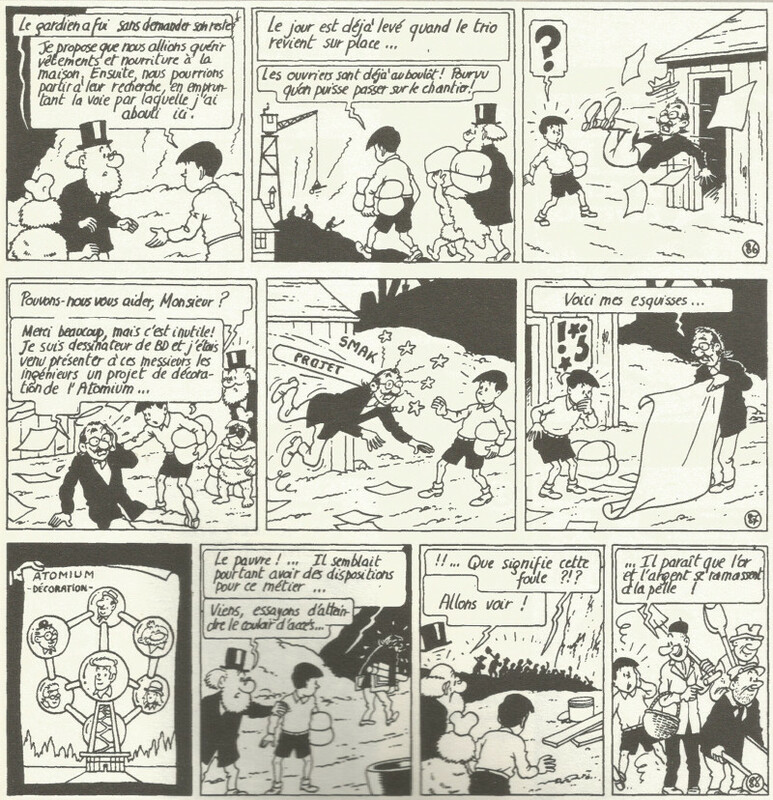 The corrected version from 1980 as publicized by Bédéscope. But back to our Bob De Moor story. When Bédéscope asked Bob De Moor to review “Het Mollenrijk”, it was a very logical decision to change those specific drawings. Almost no reader would still remember what that aborted Heysel Tower project was. But for many French speaking readers (especially those in France) the political sensitivities would be very difficult to understand. And even if they would have understood it, it could only have caused problems because many French reading Belgians probably would not have found it funny – political sensitivities you see. The mid-way solution Bob De Moor came up with was quite a good one. He changed the head of the architect by his and now he is a comic author who gets kicked out of the cabin because the architects of the Atomium don’t like his decoration ideas which is to add the faces of Georges Barelli, Sophia Barelli, Cori, Balthazar, Oncle Zigomar and Monsieur Tric on 7 of the Atomium globes. Also funny is the line where you see Snolleke saying “The poor sod! He did look like a talented guy…”. Two consistency corrections were also made on page 21 and 22 of the album where the plate saying “Hier komt de HEYSEL-TOREN verboden op de werken te komen” was replaced by “Ici sera érigé l’ATOMIUM interdit de courir sous peine de poursuites!” As a final note, today, the Ijzertoren is still a symbol of Flemish nationalism, but also a symbol to remember the cruelties that happen during wars, thus a symbol of peace. An old newsreel on the destruction of the Ijzertoren can be viewed below.